“It’s open, Mamaw! Halloween Express is open. We have to stop and buy my costume,” exclaimed my five-year old grandson as I navigated the rush hour traffic on Verona Road. “Stop, Mamaw, stop!” implored my grandson as we drove right past the store and made our way home. “Here’s an old shirt! With a pair of Mike’s old pants, this will make a great hobo costume”, Maureen announced as she dug through the latest box of old clothes that had been donated to our family. “Ooh-look at this cool vest. I can be a beatnik”, added Brenda as the rest of us converged on the boxes of outgrown clothes crammed into the corners of the closet in our bedroom. Those boxes of gently and not-so-gently used clothes, outgrown by our older sisters or donated to our family by cousins and distant relatives, were the main source of our Halloween costumes Each year we carefully planned our costumes convinced that this was the year we would disguise ourselves so well that none of our neighbors would recognize us. Trick or treating was not just a mad dash from front porch to front porch to collect copious amounts of candy. Instead our motley gang of costumed revelers was invited into each home where the occupants carefully observed and commented upon our clever disguises as they guessed who was hidden behind the wild assortment of oversized shirts and gowns, baggy pants and frilly skirts, and hats and scarves. To add to the challenge, our faces were hidden by simple black masquerade masks, homemade masks (a Dixie cup makes an excellent pig nose) and intricate makeup from the stash that had been carefully purchased from Goff’s Five and Dime. Our older sisters, Mary and Sue, had perfected the art of teasing hair for beehive hairdos and helped us create interesting new hairstyles as part of our new personas. Our plan to fool the neighbors involved not only designing our costumes, but also careful strategizing about whom to invite to join us as we went trick or treating. Traveling in our usual cluster of the four middle Daly girls would be a dead give-a-way as the neighbors would recognize our stair-step configuration from our daily walk to school past their homes. So each year, we would recruit carefully selected classmates to join us in our quest to costume ourselves so cunningly that even Mrs. Crosby, the lay teacher at St. Joseph school, would fail to recognize us. Her ability to quickly identify each and every member of each and every costumed gang who came to her door year after year after year was the stuff of legend. As Halloween approached, I spent much of the school day torn between paying careful attention to my work and considering the best person to ask to join us on Halloween night. Each school day began with morning Mass, said in Latin of course, and I confess that I grew quite skilled at appearing to be devoutly lost in prayer while surreptiously studying my schoolmates. As we knelt for the Consecration, the most solemn part of the ceremony where the miracle of transubstantiation takes place, I would pretend to raise my eyes to the Host. In reality, I was surveying the rows of students in front of me to consider the best persons to recruit as we created new squadrons for Halloween night. I continued my quest as we stood beside our desks reciting the Pledge of Allegiance, as we marched to the front of the room for our oral book reports, and during recess as we scuffed our feet on the dusty playground. Finally, I decided to invite Kathy to join us on Halloween night. Kathy was the only child of the owners of the local drug store that was just two doors down from dad’s grocery store. It would be easy for her parents to come get her when their store closed so her presence would not complicate the nightly chaos that was bedtime in the Daly household. As an only child, Kathy’s life was much different from mine. On my visits to her house, I envied her room with two bunk beds just for Kathy. I admired her closet where her many pairs of shoes lined the floor and her clothes hung neatly in a row and not jumbled in with clothes for three other girls. Kathy’s mom took her to the salon downtown to get her hair styled while my sisters and I went to Mrs. Ratcliffe’s shop in a converted garage to get our hair cut and endured Tonette home perms in our kitchen. On the other hand, Kathy longed for sisters to play with and jumped at the chance to plunge into our boxes of ‘costumes’ and let our older sisters transform her hair with careful teasing and lots of hairspray, and disguise her face with makeup and one of mom’s old hats with a veil. Defeated we asked Mrs. Crosby how she knew who we were. Jo Ann Carr is a beginning storyteller who has dreamed of being a writer since childhood and who hopes to attain that dream so that her children and grand-children will inherit a multitude of family stories. Well done Jo-Ann! What a great memory—and so well crafted! 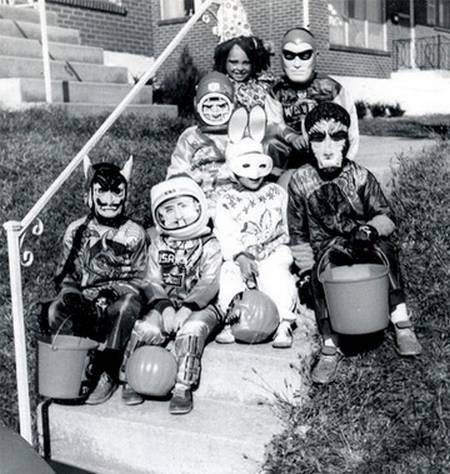 You evoke a long ago time when trick or treating, especially for the younger kids, was an exciting adventure. I was right there with you from beginning to end. I remember the fun of having the “old people” trying to guess who we were. Times change don’t they. Thanks for sharing this piece. I will look forward to more.